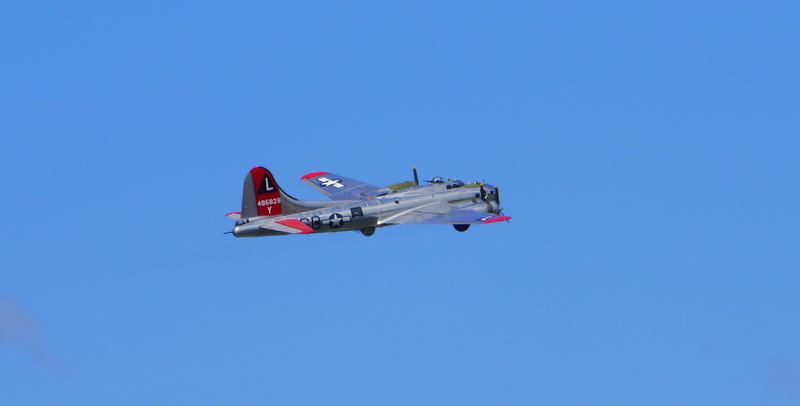 The Memorial Day airshow at the American Airpower Museum at Republic Airport in Farmingdale, New York is always spectacular. This year was no different. There was a wide variety of aircraft on display, including a number that were Second World War warbirds. 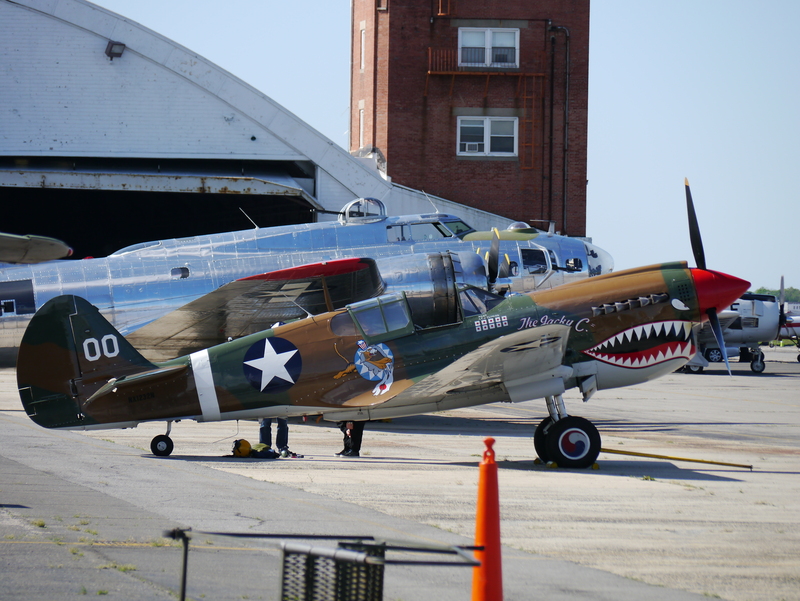 Here are two – a B-17 Flying Fortress and a P-40 Warhawk done up in Flying Tigers colors. 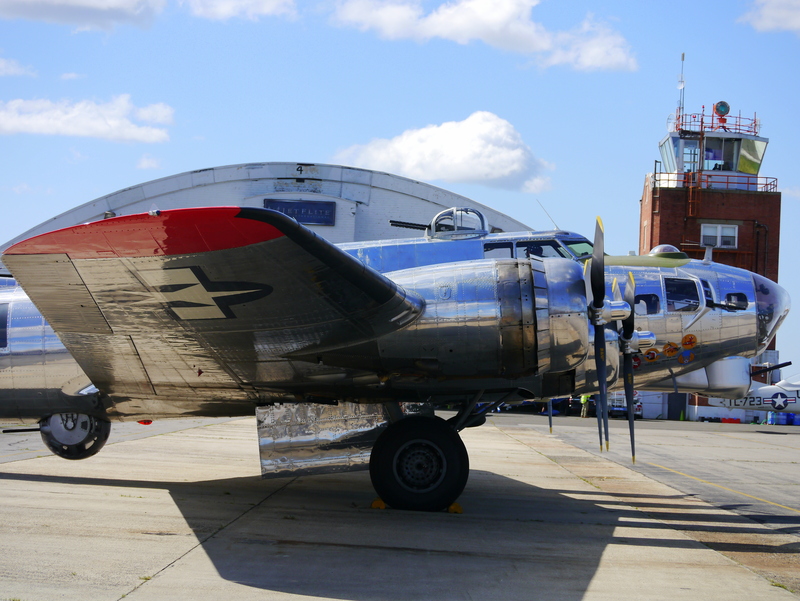 Take a good look at the all-metal scheme on the B-17. That was to save weight by not applying paint, and also to entice the Luftwaffe to find them and come up and duel. Luftwaffe combat losses were so heavy, and the requirement of keeping so many fighters back in Germany on defense so onerous, that the USAAF had almost total air superiority by D-Day. All images copyright MGD Research Company, LLC. Okay, perhaps Skynet is not just around the corner. That will take some doing. But the infamous, artificially-intelligent mastermind behind the Terminators just got one step closer with the launch of the naval UCAV X-47B from the deck of the aircraft carrier USS George H.W. Bush on May 14, 2013. Eventually, major weapon systems will be autonomous, uninhabited machines, whether aerial, naval, or ground combat units. Right now, the major advantage of a human-crewed machine is the brain of the person inside it. Human warriors are much more adaptable and creative than machines, and can react faster and more appropriately to changing situations. The future will be different. In time, the technical challenges posed by genuine artificial intelligence will be overcome, and an uncrewed vehicle will be as capable, or perhaps more capable, than a crewed craft. A significant portion of a modern fighter aircraft’s weight, for example, is taken up by the systems needed to allow the pilot to fly the warplane and to keep the pilot alive. If you can remove the human from inside the cockpit, you won’t even need a cockpit anymore, and can save a huge amount of weight, such as the ejection seat, which can be devoted to extra ordnance or fuel. That will be an enormous advantage over a piloted machine, assuming that all else, such as outright combat capability, are equal. Although the troubled F-35 program has been reported on extensively in the past, it is not often that the mainstream press reports specific problems with the actual aircraft under development. That is why the April 2013 issue of Popular Mechanics is noteworthy. Joe Pappalardo has penned a short article about several development problems of the F-35B (that’s the Marine Corps version that can land vertically) and potential fixes for them. Interestingly, and perhaps most worrisome, the maneuverability of the F-35B has been reduced from a sustained 5 g’s turn to 4.5. There are other issues too, and I recommend that you check out this issue for them. It seems that the decision to buy the aircraft while it is still in development has not proved to be a happy one. Time’s always awesome Battleland has just run a fantastic article by Mark Thompson about the endlessly troubled F-35 program. As you will recall, the F-35 Lighting II is intended to be a stealthy, multirole fighter for the U.S. Air Force, U.S. Navy, and U.S Marine Corps. It is this attempt to be all things to (almost) all services that has held back the program, and perhaps even prevented the F-35 from ever becoming a useful fighter airplane. Among other interesting tidbits of information in the article: The design blueprints for the aircraft are changed ten times every day of the week; the plane has a short range and the carriers it flies from will thus have to move dangerously close to enemy territory before they launch them; the 133,000 jobs currently tied to the F-35 program exist in no fewer forty-five of America’s states; the F-35 may not even outperform earlier aircraft in the U.S. arsenal, such as the F-15, F-16, or F-18, even though those planes are several decades older and less expensive; the bill for the projected 2,457 F-35’s to be procured by the U.S. will cost an eye-popping $396 billion, which is double the initial assessment when the program began; the three models of the F-35 now under development will be slower and less maneuverable than originally planned; the stealthy characteristics of the F-35, which have increased its costs and development problems, may not be of much use in evading air defenses after all in a world with better sensors and better computers; and the lifetime cost of maintaining the fleet of F-35’s is estimated be an astonishing $1.5 trillion. After reading this article, which should be required reading for all American policymakers, I wonder if the United States has just spent a fortune developing the most advanced dirigible airship or sail-powered ship-of-the-line when the weapon type itself itself fading rapidly into obsolescence. The F-35 Lightning II program has been beset by a number of problems that were not anticipated when it was first proposed. It is astounding, even when considering the technological advancements that the F-35 represents, for a military aircraft program to require more than eleven years of development and not a single operational squadron yet exists. If you have been reading this blog, you are well aware that one of the underlying reasons that America pays so much for its weapons is because the Pentagon seeks to push the tech envelope in every direction. Sometimes, this results in a remarkable weapon system, such as the M1 tank, while in others, the result is dubious (the V-22 Osprey) or both (the F-22).The F-35, which is shaping up to be the costliest weapon buy in American history, may never be the cost-effective, multi-service jet that was promised. It was meant to be a fighter usable by the US Air Force, the Navy, and the Marines, as well as a number of other countries. The problem is that Lockheed had to design a fighter that was stealthy, like the F-22, could dogfight, drop bombs, carry its weapons internally to keep it stealthy, and, oh yeah, land on a carrier by hovering, just like the old Harrier jump jet. Getting all of these opposing design requirements to work in a single package, at a reasonable cost, no less, has proven far more difficult than expected. The F-35, which appears to have a distressingly short unrefueled range, reminds me of a latter-day F-111 Aardvark, a swing-wing jet of the 1960’s that, as a cost-saving measure, was supposed to be used by both the Navy and the Air Force. As it turned out the F-111 proved to be too heavy to land on carriers (oops!) and the Air Force was stuck with it. Irony of ironies, this big and heavy “fighter” was actually used in the light bomber role by the Air Force, which demonstrates that trying to be all things to all people usually means that you are nothing to everyone. At this stage, it seems likely that the F-35 will never live up to the hopes expressed upon the inception of its plan, but it is too far along to give up, both politically and economically. Something will have to be salvaged from this otherwise unhappy fighter program. Look for far fewer purchases than anticipated, as newer and better Unmanned Aerial Vehicles (UAV’s) emerge from the drawing boards of aerospace companies. UAV’s are not yet the Dreadnought battleship that renders all previous designs obsolete, but they are getting close. Read about the sorry details of the F-35 here. The naval situation in East Asia has just gotten more interesting. China has just achieved its first carrier jet landing on the recently-commissioned Liaoning. Take a look at a photograph of the Shenyang J-15 here. The Pentagon has not been impressed, but I think that it is watching China’s single aircraft carrier (for now) very closely. Something tells me that China’s growing naval power will be used to justify big American defense budgets for many years to come. In the meanwhile, Japan is eyeing China’s build-up nervously. It is responding with some moves of its own. Anyone interested in aviation will want to read this article in The Atlantic. Without a doubt, the Chinese J-31 stealth fighter bears more than a passing resemblance to the American F-22. While espionage is always a possibility, the more reasonable interpretation for the outward similarity of the two aircraft is that the Chinese have studied the contours of the F-22 very closely, and since they are seeking to solve the same problem that the U.S. Air Force is – evade radar – the Chinese designers have applied a ready-made solution to the problem. It is also likely that the F-22 is still more advanced because of a variety of special coatings and other onboard technologies that can’t be copied so easily.